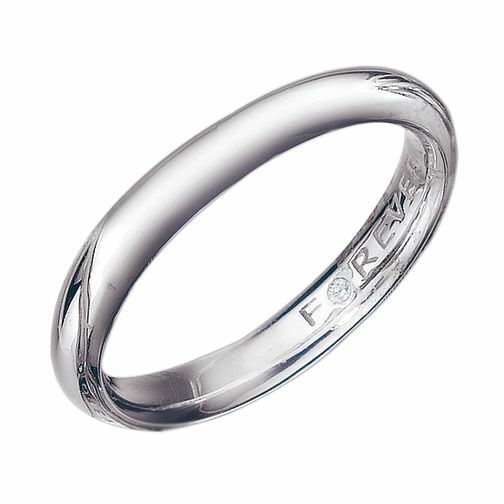 Express your love and commitment with this stunning wedding ring from The Forever Diamond. Measuring 3mm wide and crafted from sleek palladium for a durable and contemporary feel, this elegant wedding band has the word Forever engraved in the inner shank and is set with a single diamond. Palladium 3mm Forever Diamond Wedding Ring is rated 5.0 out of 5 by 3. Rated 5 out of 5 by Anonymous from Lovely ring and goes well with engagment ring from same forever brand. Arrived in store promptly, even though on website said would take 6-8 weeks. Lovely ring, nice finish to edges and very shiny! Good fit also. Rated 5 out of 5 by Anonymous from Perfect for forthcoming wedding Item arrived in days not weeks as indicated. Beautifully boxed. Cannot fault. Just got to wait till the wedding to wear it.